This Friday, students and faculty across all divisions and grades participated in an all-school Day of Service event, collecting and sorting donations for those in need, and helping provide over 10 thousand meals for the hungry while learning more about food insecurity around the globe. Partnering with Cradles to Crayons, a non-profit organization that provides children living across the country with the essentials they require, students in the Primary and Lower Schools helped sort donated clothing they had been collecting all winter with the help of the D-Team. Students in Pre-Kindergarten through Grade 3 helped organize winter jackets, hats, mittens, boots, sneakers, and children’s books and toys, transforming the Hersey Gym into the Cradles to Crayons’ “Giving Factory” for the day. Personal hygiene products like toothbrushes, shampoo, and deodorant were also collected for Wellspring, a multiservice center in Hull that provides support to people to help them achieve independence and self-sufficiency. Throughout the day, students and faculty in the Middle and Upper Schools worked together in the McKelvey Gym to package meals for Rise Against Hunger, an international hunger relief organization that coordinates the packaging and distribution of food and other life-changing aid to people in developing nations. 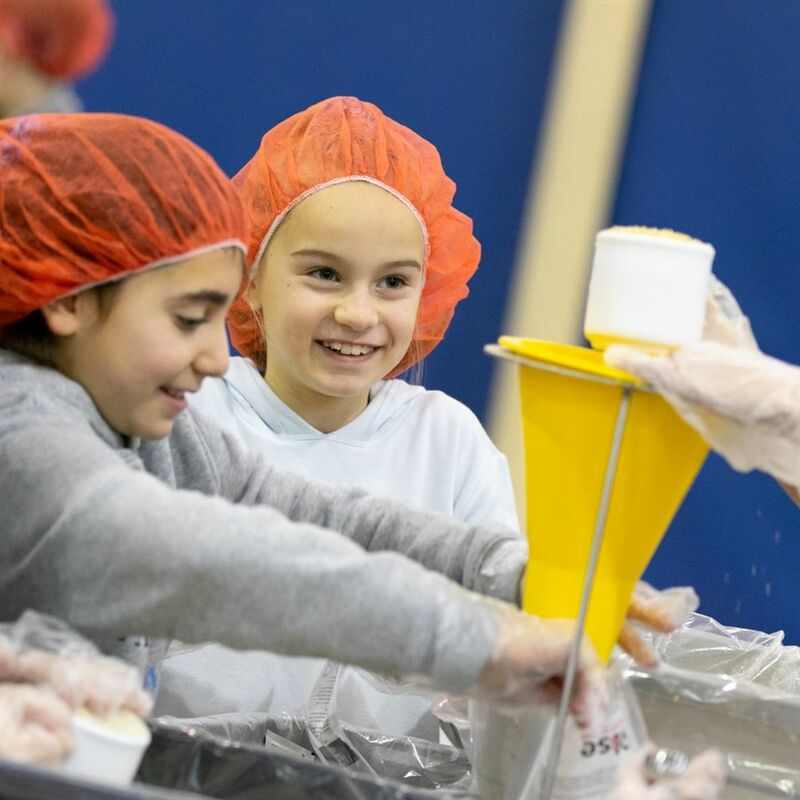 Assembly lines for food distribution, sealing, and packing helped prepare more than ten thousand meals for those in need across the globe. Students also convened to learn more about the Meals on Wheels program and discussed the causes of world hunger, food insecurity, and ways to provide aid, giving a new perspective on the day’s efforts. Pal groups then participated in a collaborative art project centered around the question: “What do you bring to the table?” Based on the folk story, Stone Soup, students drew and designed bowls to fill with elements they believe create positive change within their community, like dedicating time, talent, and treasure, and asking, “what can your talent provide to others?” The colorful bowls will be displayed as an installation in the Brown Art Gallery.